Affordable makeup is something I think everyone is looking for, especially if you are at school or on a budget like me. Don't get me wrong the idea of having a full high end makeup collection in your house is like a dream but what if you are unable to afford that type of luxury. I will be giving you a full insight into affordable high street makeup that is perfect for any one. Whether it be powders, foundation to bronzers and eyeshadows. Ill show you the best affordable makeup out there and where to buy it. Make up Gallery Pressed Powder in Natural Beige 2 - Poundlands very own makeup range. I was apprehensive at first about buying products from this range but once I did, I never looked back. Stays put all day, doesn't budge or flake. Lumiere Bronzer from Home Bargains - £1.99 and it comes with a brush. 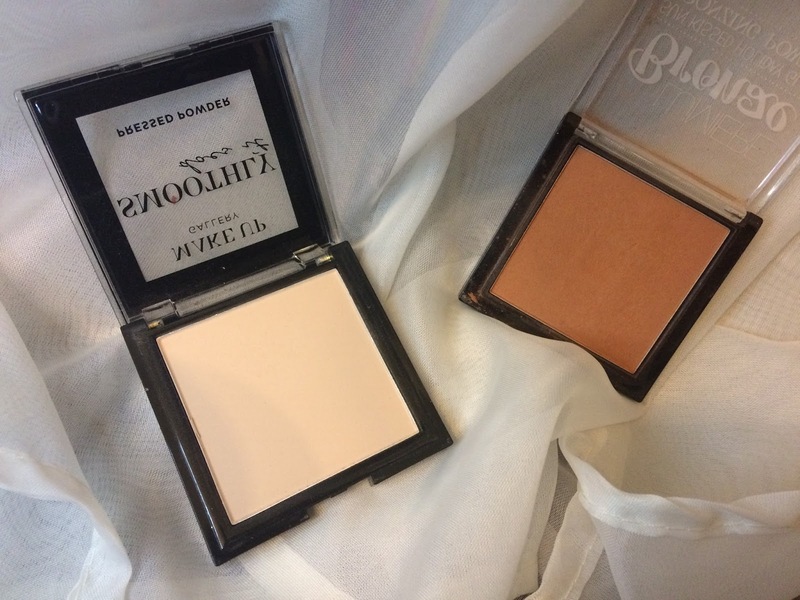 This bronzer is perfect for during to summer to add that healthy glow to go with a tan. Stays put all day and doesn't budge or flake away. These are all w7makeup makeup range. - Can be found online, TJ Hughes, Boyes, Savers. Foundation - Genius Feather Light in Natural Beige. Full coverage, not too thick of a formula, perfect colour for my skin. The dropper effect for the bottle is perfect for just adding that perfect amount to your sponge or brush. Concealer - Corrective concealer in Light. Small pot easily used for travel. Full coverage concealer especially for under the eyes, easily blended. Camera Ready Primer - Not to thick or slimy. Some primers I feel are either too thick or extremely slimy on the skin. Which isn't a nice feeling for anyone to be honest. No one wants a primer that doesn't react well to the sun or makeup due to be being really oily and slippery on the skin. Eyeshadows - The Naughty Nine eye shadow palettes. Shades - Mid Summer Nights and Arabian Nights. These colours are perfect for any occasion as you can mix and match with the colours. Super pigmented, so the colour in the palette is exactly the same on the eye. All products in the w7makeup range, the prices range from £1.99 - £10 for the makeup alone. All the products I have shown today are staples in my makeup bag and are so affordable for everyone, they have something for everyone as well so if you need to test a product you can. Just to make sure you have the perfect colour or shade/formula for you!